Made in-house in downtown Toronto! 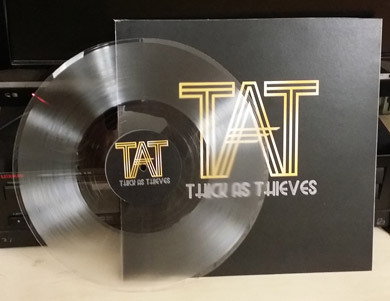 Lathe cut records are ideal for promotional use, limited editions, etc... They are cut one at a time in real time and finished by hand. Coupon codes can be entered on the next page. You must supply files ready to print. Design assistance is available at extra cost. 7" and 10" record label, 3.625"
7 inch glued jacket, 7.25" x 7.25"
7 inch foldover, 7.25" x 7.25"
Tax will be applied on Canadian orders. International clients will have to pay their own VAT and customs fees upon reception except in the USA where there is NO TAX. Upload your files to the link shown after you submit the order. Alternatively, send all files to your rep and/or to info _at_ duplication.ca, using google drive share, wetransfer.com, dropbox, or an equivalent 3rd party service, unless they are small enough to send as an email attachment. AUDIO : 16bit/24bit, 44.1 - 96khz, MONO, .wav/.aiff files are ideal, but we can accept any file format. Please label the files/folders clearly so we know the order, and which side to put the files on, if you're doing 2-sided records. If your audio is in stereo, we will convert it to mono. Occasionally, depending on the audio, this conversion CAN have negative results, in which case, we will get in touch with you to explain what to do. B) fit the entire square INSIDE the circle (resulting in white space around the image. This space can also be another color if requested). 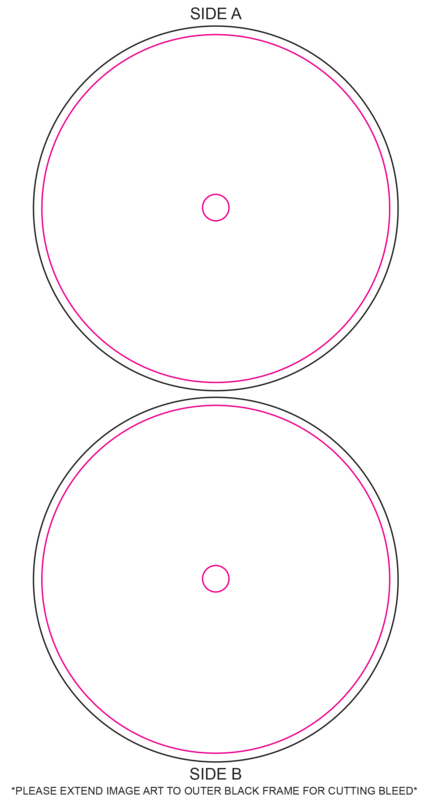 Keep in mind that if you are using the cardboard jackets with hole, there is a 3 3/32" circle cut-out in the middle, so that section of the picture disk's graphic will be visible when it is in its jacket. CENTER LABELS : 300dpi, .tiff, .pdf, or .jpeg, 3.625" circle, is ideal, but we can accept any format, just let us know what you want done! Our hand-made records are very nice to listen to, and play well on any well maintained record player, HOWEVER, they are NOT THE SAME AS STANDARD VINYL RECORDS. A) The groove on a lathe cut is EMBOSSED, not CUT, so it is not as deep a groove. This does not affect audio quality, but it does mean that a record player with a damaged or worn-out stylus will tend to skate, and will not work for our records. Also, occasionally your stylus will land BETWEEN the grooves, resulting in a strange, distorted playback. In this case (maybe 1 in 10 times you drop the needle) simply lift the tone arm, and drop it again in a slightly different position, or just gently nudge the stylus. You will hear the needle drop into the groove, and the audio will sound crystal clear. If this doesn't work, increase the tracking force on your tonearm to 2 grams, or place a small weight on the cartridge. If this doesn't work, sorry, you need a new needle! C) There is more 'noise' then a modern LP, the pops and crackles will be audible, even when your record is brand new. You can order a test cut and a rip to MP3 to check the quality. D) Although the cutter-head and amplifier used in the making of your record are exceptionally high quality, the nature of the techniques involved in creating a lathe cut disk results in some loss of clarity, especially in the very high, and very low frequency bands. Again, you may need to use that stereo of yours and pump up the bass and the treble! E) Unlike dub plates, lacquers, flexi-disks, and many lathe-cuts, our lathe cut disks will NOT wear out with use any faster then a vinyl record, so go ahead and play your record all you want! F) Our records are made by hand so they won't be perfectly finished like a factory-pressed vinyl record. You can pay by credit cards and PayPal after submitting your order. - paypal to paypal@duplication.ca, or we will send a PayPal invoice which can also be paid by any credit card. - Visa/Mastercard on this payment page if your order is in Canadian dollars. Once you get a quote please send a 50% downpayment, we will begin production once this payment goes through. Yes! Worldwide! Postal shipping costs will be added to your order. Express or ground courier shipping can be purchased at additional cost. 3 - 6 weeks for complete production. We can make one sample test cut for you right away (without graphics).